As they arrived at Ben Gurion Airport, before they even checked in their luggage, the group was interrogated by security (don’t be alarmed, Israel is known for tight security). The security officer in charge asked lots of questions about everyone and even left to speak to her supervisor. Admittedly, it was a little bit intense, but after one hour of questioning and passports checking they were finally allowed through. Once on the plane everyone laughed about it and thought it was a really funny experience. 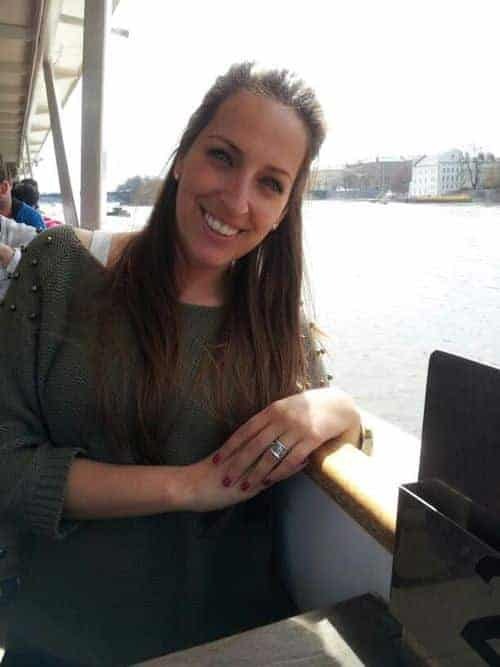 Liron knew someone who worked there and told her that her colleague needed to work on her profiling! The security was not mean by any means, but after that…. everything went better than expected. The flight landed one-hour earlier and almost everyone slept on the plane, however still arrived feeling a little bit tired. 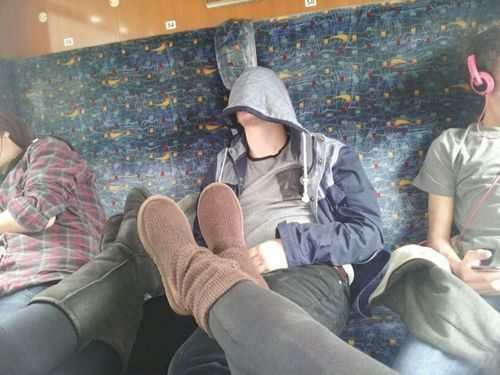 In order to gain the most authentic experience, they took public transport to the hotel. There is nothing more interesting than seeing a new place through the eyes of those who live there. Often it’s the simple experiences that provide intriguing insights into each place. 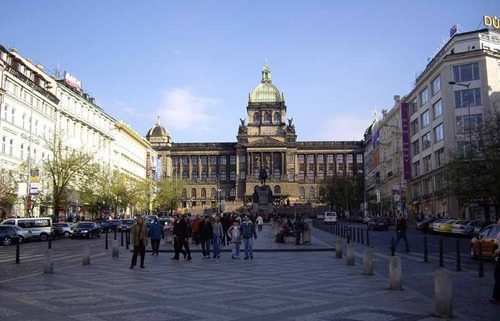 So, they took a bus and metro to the hotel, which is located in Wenceslas Square. This square is practically the main centre point in Prague! The location is “ridiculous”, (and mentioned a few times) is the main hot spot. The hotel is spacious and the boys have a queen size beds to themselves. 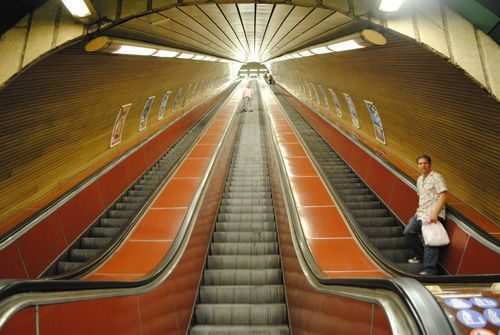 Once they dropped off their luggage they took a metro to Josefov (the Jewish quarter). Jews are believed to have settled in Prague as early as the 10th century. But what’s even more interesting, is that everything was really well preserved even after World World 2. Hilter loved Prague and didn’t want to destroy it and also wanted to preserve all the Jewish artifacts and rare objects to show what the “extinct” race was like. 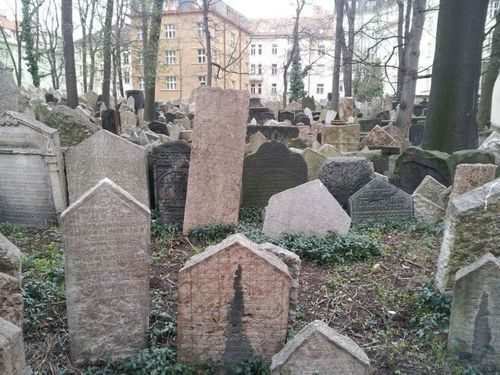 Then they went to the Old Jewish Cemetery. The numbers of grave stones and numbers of people buried there are uncertain, because there are layers of tombs. However, it has been estimated that there are 12,000 tombstones presently visible, and there may be as many as 100,000 burials in all. It’s one of the only places in the world where you can see the Jewish history from the 1500s. It holds a lot of significance for Jewish ancient history. 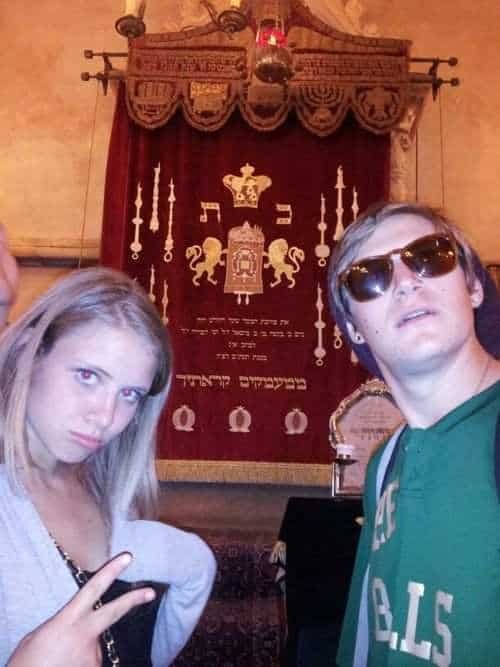 Then they went to the Spanish Synagogue. 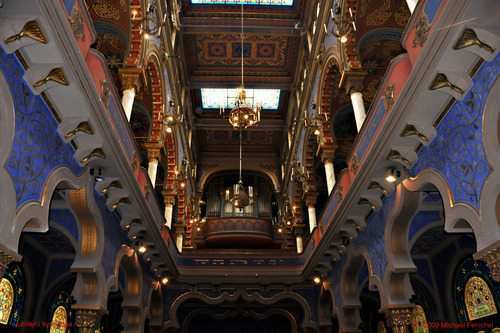 The Moorish-esk architectural style has many features reminiscent of the Golden age of Jewish culture in Spain. 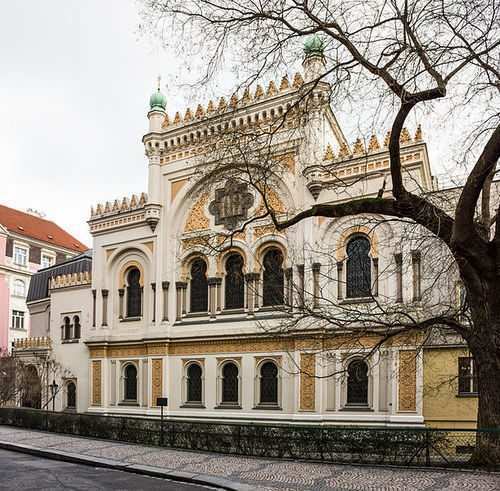 Then they went to the Old New Synagogue which was completed in 1270 in a gothic style, in fact it was one of Prague’s first gothic buildings. 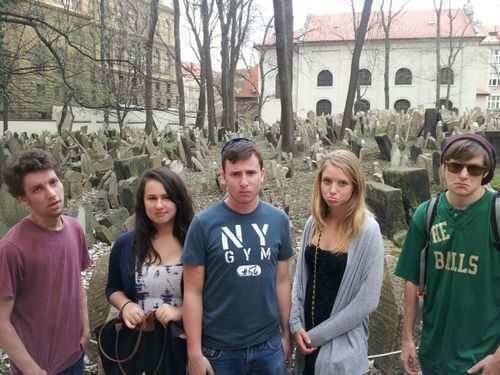 Lastly, the went to the Pinkas Synagogue which commemorates the 6 million Jews that were killed. For lunch they found this cool cafe and ordered take-away sandwiches. Enjoyed by all! From the Jewish area they continued down to a street fair called Havel’s market. It was a nice outdoor market full of fruit, veggies and local products. They were there for an hour and afterwards walked through Myslbek Shopping gallery (Na Příkopě 19) and suddenly realized that they were right by their hotel! It was so convenient to be so close to home. At that point Liron could see that everyone was REALLY tired, their eyes were closing. The group had an idea that since they were so close to the hotel, that they decided to take a quick power nap, hits the shower and get ready for dinner. The nap gave everyone that extra boost for the evening. Dinner was so much fun– everyone LOVED the food and it was really tasty. It’s a well known restaurant, great reviews and highly recommended. 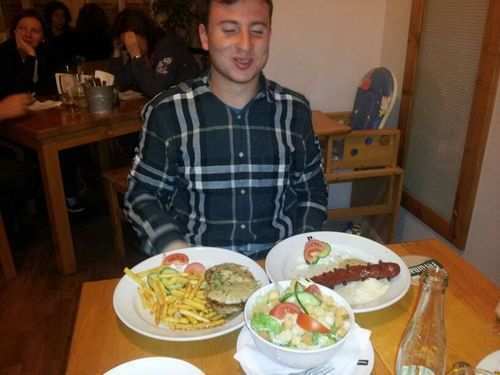 The portions were big and everyone liked their food… Nicholas even ordered 3 main dishes! 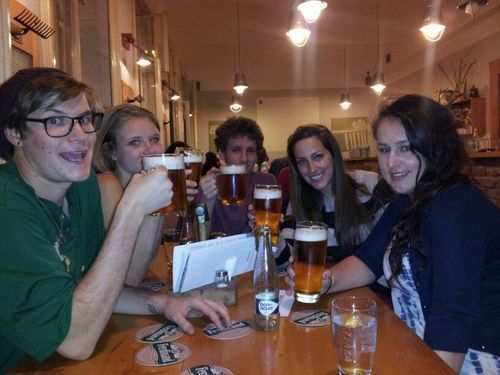 It was really chilled evening and everyone enjoyed a beer at the restaurant. After dinner Nick & Liron came back to hotel while the others went out to see the city at night. They came back around 11 and wanted to save their energy for the rest of the trip. The day started off well… with good food that it is! Breakfast at the hotel was really good with fresh sandwiches and tasty eggs. Funnily enough the security problems from the airport seemed to follow them all the way to the Israeli embassy! After a while they all left their belongings in a locker but kept all their essentials (passport, money I.Ds) on them. Liron said, “at least they gave us the keys” to which Clara retorts, “What? You don’t think they have copies”. They met the Israeli Ambassador and all agreed that it was the best ambassador meeting hands-down! Yaakov Levy spoke really good English, asked questions about the students and told them highly secretive information that I can’t even mention here. Yaakov used to be the Israeli Ambassador to the UN. He told so many stories it was incredible! Jordy was amazing and asked lots of questions, and Matt was really vocal and spoke up – Liron was impressed. From there they walked through a nice big park and then they walked down to the river. Then they crossed the river and walk back to Old Town Square where they had a quick lunch. From there they went to the river for a one-hour river cruise. It was really relaxing and fun! The weather has been great reaching mid 70s. 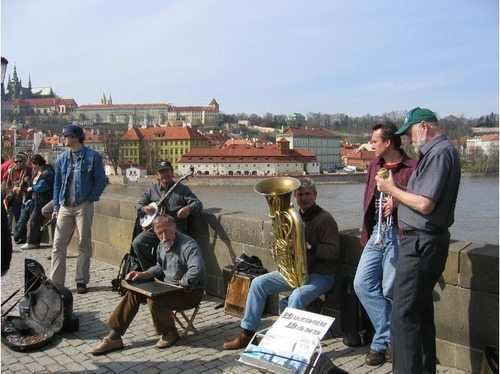 Then they decide to visit and explore Charles’ Bridge; a pedestrian bridge known for street fairs, music, JEWELRYmakers and people who draw cartoons. From there they decided to take everything in and chilled down by the river and enjoy the majestic scenery! Since Liron believes in a democracy she was out-voted against participating in the Beer Challenge… and so it was cancelled. (Ironic isn’t? 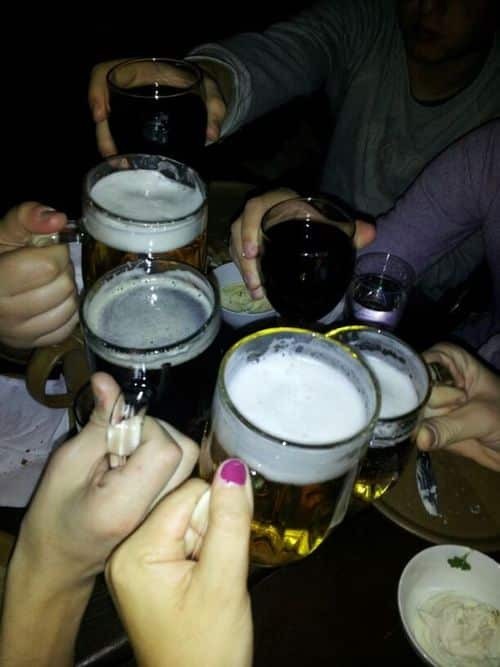 This is coming from a bunch of 19 year old refusing free beer) but they guys preferred to go back to the hotel, rest, shower and then go out for dinner and drinks. A quick pit stop was had; Arielle, Jordy and Nick went to H&M for some quick retail therapy. Arielle bought these stunning jeans. Before dinner, Liron asked around for local recommendations of unique places to eat instead of those touristic spots. Dinner was delicious and Nick enjoyed the food as usual! Nick basically looks forward to the next time we eat. He looks so good cause he eats so good! Liron wants to know where all of it goes. That’s all for day two… check in tomorrow for adventure number 3! Oh and by the way they are all convinced that Nick is secretly transcribing all their conversations because he’s always typing on his phone… and does it a really secretive way! Unfortunately his phone is password protected. As usual they had a good & hearty breakfast at the hotel, and then set off for a WWII walking tour. They met the tour guide at the Powder Tower. 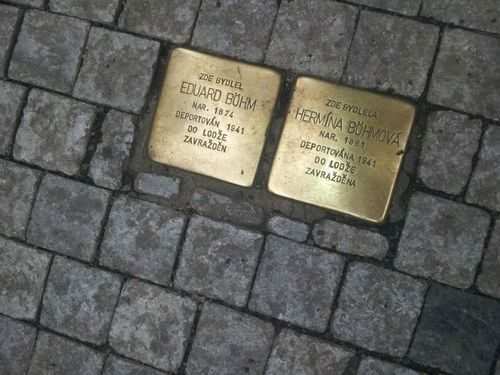 Bronze placards are placed all over Europe and here in Prague (below) to commemorate all the Jews who lived in those houses before they were deported to concentration camps. They also saw posters of Jewish people who used to live in those places. Besides the heaviness of the topic, Liron said that the tour was amazing. 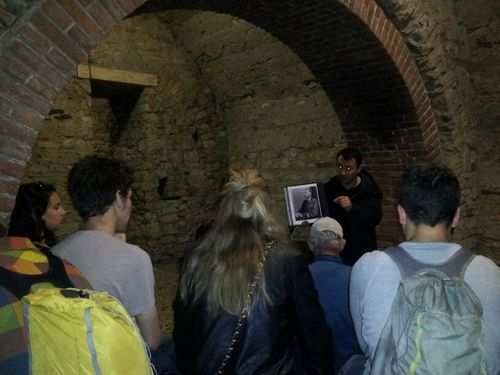 The students really enjoyed it and the tour guide was great, interactive…. and they learnt a lot. 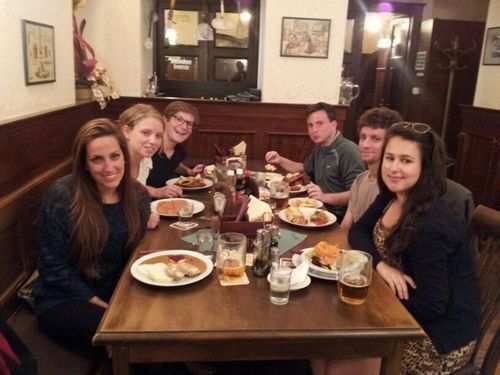 Then they went for lunch, which was really authentic Czech cuisine. 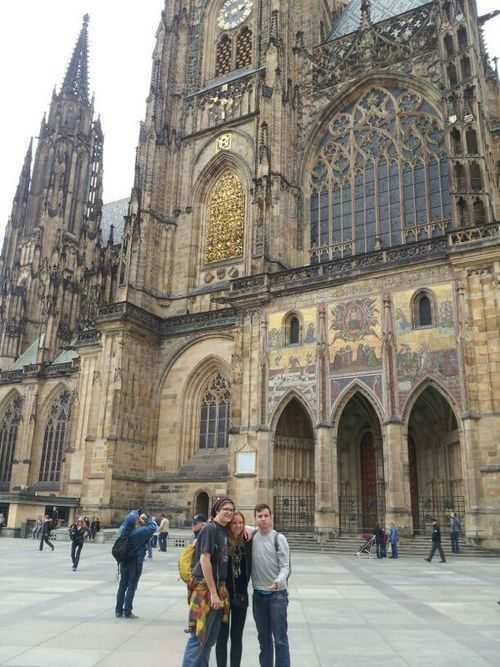 Then with full bellies, they went to the Prague Castle. 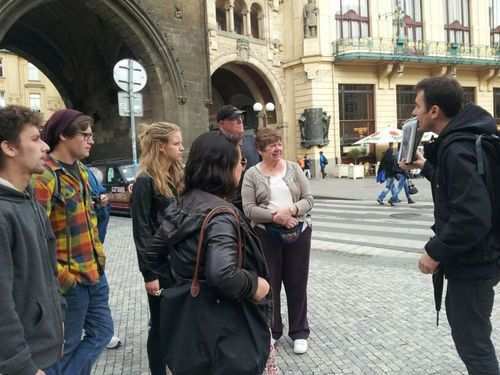 They walked around the Prague gardens and took in the beautiful scenery and history! 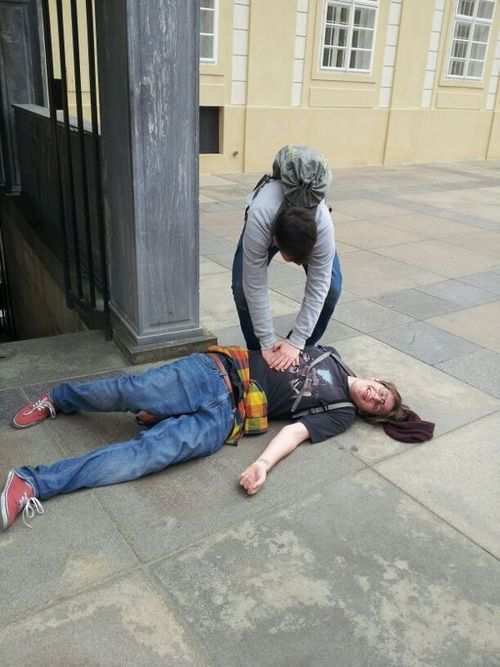 Jordy was really tired and was lying on the floor because the castle had too many stairs. 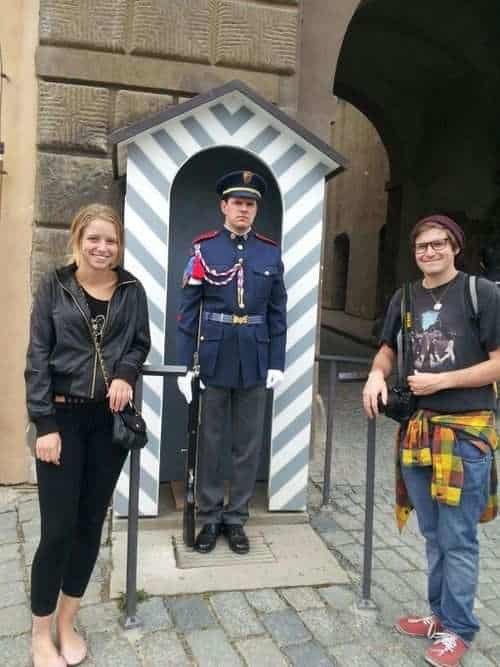 Here is a photo of Arielle and Jordy with two guards standing outside the castle – Just like Buckingham Palace. The castle had an interesting background, as this is where Hitler & Reinhard stayed when they came to visit Prague. It was one of Hitler’s many headquarters. While they were there they also visited the Cathedral, which was absolutely stunning! They took a light rail back to the hotel to relax, shower and change as they went to a Medieval Tavern for a dinner and a show! It had crazy medieval scenes with snake dancing and a fire show! Followed by a couple of beers. 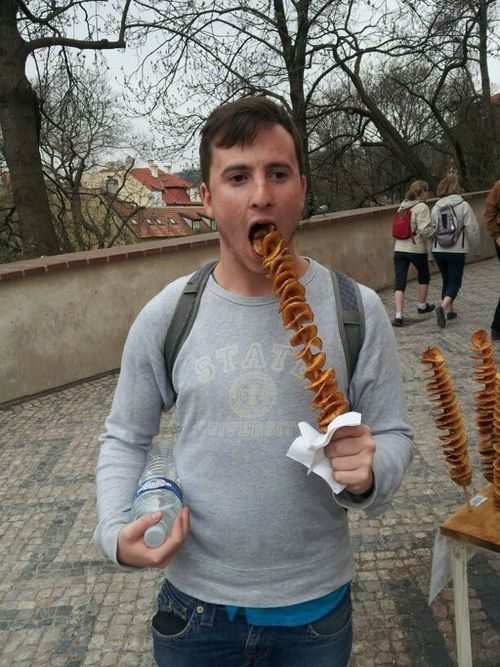 Again…Nick loves his potatoes, as do the Czechs! It’s only day four and there’s still so much to see. 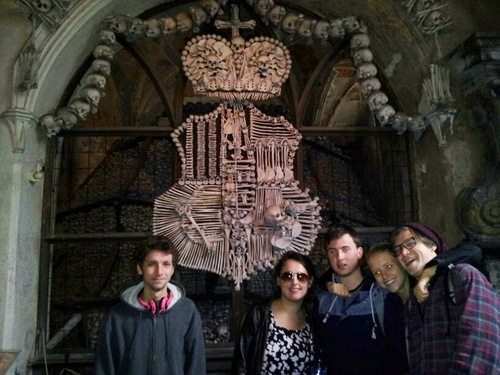 Today the group left the city they’ve called home and set off to travel on a day trip to a Medieval city called Kutna Hora. The “town” is situated in the Central Bohemian Region, which is now part of the Czech Republic, it was first established in 1142. In 1260 German miners began to mine for silver in the mountains. (Note this point: Kutna Hora is literally translated to mining mountain). 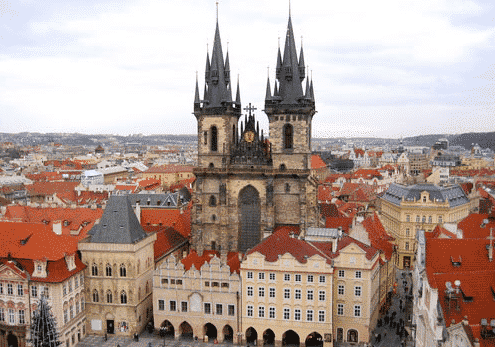 From the 13th to 16th centuries the city competed with Prague economically, culturally and politically. Since 1995 the city center has been a UNESCO World Heritage Site. 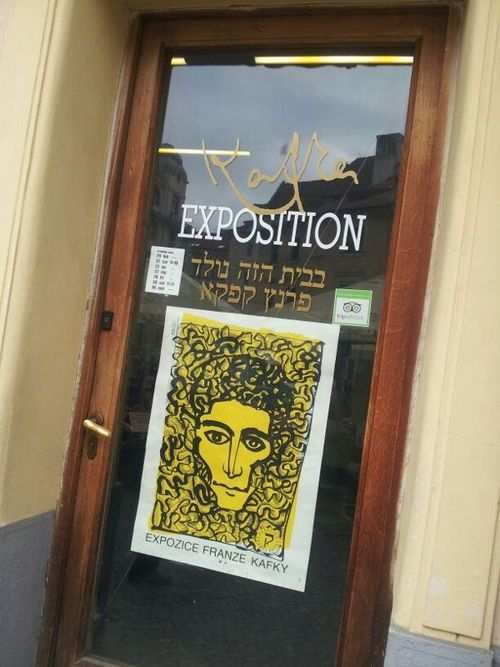 The group was excited to go, and on the way to the train station they stopped by the Jubilee synagogue in Prague. 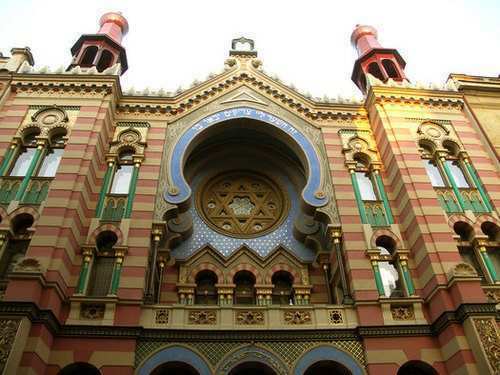 It is also known as the Jerusalem Synagogue because of its location to Jerusalem Street. It was built in 1906… it was beautiful! 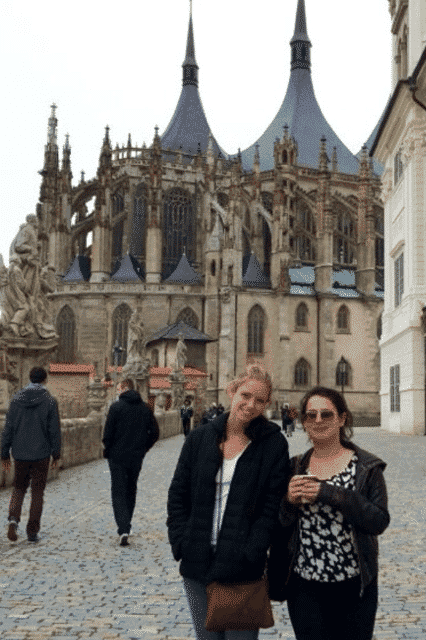 So off they went and caught the train to Kutna Hora… Matt relaxed, listened to music and watched the scenery, while Jordy took the opportunity sleep. He was out cold! Both Liron & Clara rested their feet him on. Everyone really liked the tour… sometimes it’s the simplest things that we appreciate while travelling… i.e the tour guide spoke good English! 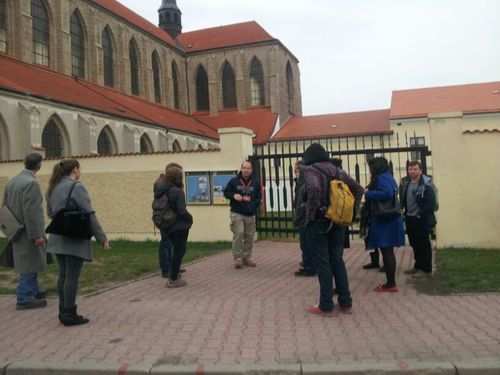 The American tour guide unraveled the history of the German mining town, and they visited the most important buildings in the area; which was the Gothic, St. Barbara’s Church. It was built at the end of the 13th century. Then… the most intriguing (or eery, which ever way you see it) was touring the Bone Chapel. It is estimated that the chapel contains the skeletons of between 40,000 and 70,000 people, whose bones have in many cases been artistically arranged to form decorations and furnishings for the chapel. How does a skeleton chandelier made out of bones and skulls make you feel? What about the Schwarzenberg coat-of-arms made with bones? Nothing else to say, but yes! See you tomorrow. Today was the last day of the amazing breakfast. I know we say this every day, but it’s a cracking way to start the day. 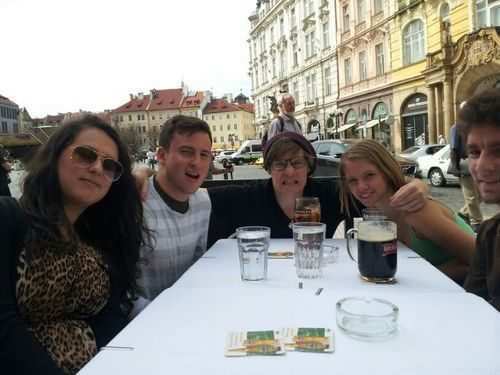 They checked out of their rooms, left their luggage behind and set off to explore Prague for one last day. They walked through to the Old Town, which dates back to 1100 CE. Actually, back in the day the Old Town served as a Saturday morning marketplace for fresh produce and also for large military gatherings. 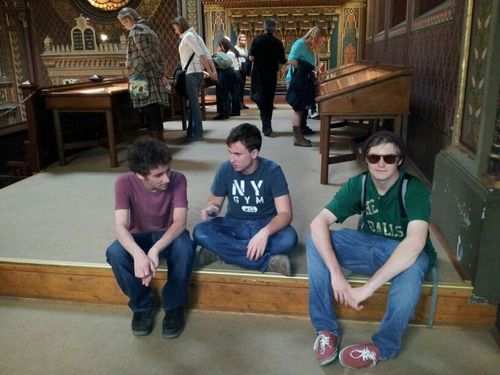 As you can see below everyone is chilling out and soaking up the history and culture. Notable places in the Old Town include the Old New Synagogue which is still running to this day. Also the Astronomical Clock, which was first installed in 1410, makes it the third-oldest astronomical clock in the world and the oldest one still working. Liron said it was breath taking! 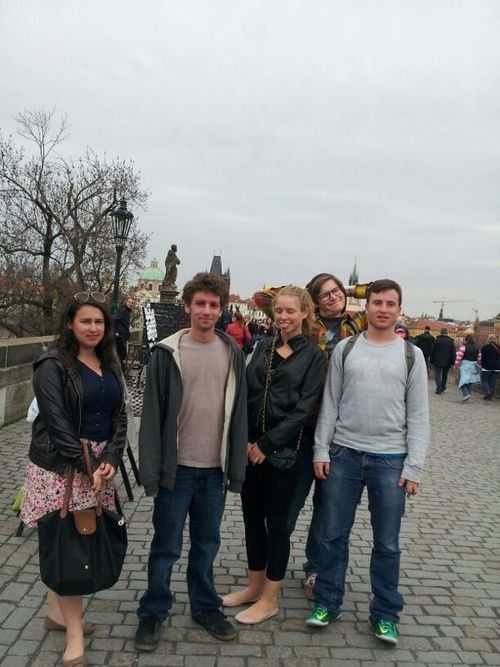 When traveling it’s always nice to re-visit the city’s famous monuments … so on the way to lunch they crossed Charles Bridge once again! Lunch was great and so was the view. It looked over the entire city, it was pretty. The Israeli Ambassador contacted Liron and invited them to an Israeli rally. In fact, it was a pro-Israel rally commemorating the Holocaust. Liron mentioned that they still feel guilty as to what happened here in WWII. But at the same time, it was touching and heart-warming to see all the support. Really. 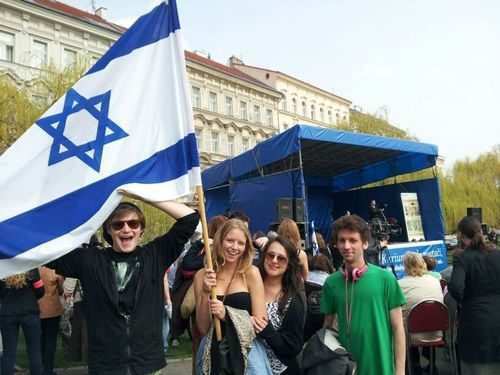 It’s good to know that the Czech Republic is a good friend of Israel! Here are some interesting facts: Czechoslovakia was one of the 33 countries that voted in favour of the 1947 UN partition resolution, which led to the creation of the State of Israel, and was among the first countries to recognize the State of Israel, which it did on May 18, 1948, four days after Israel’s declaration! 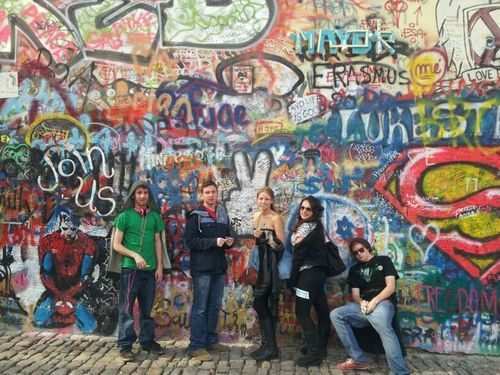 From there they went to the John Lennon Wall. 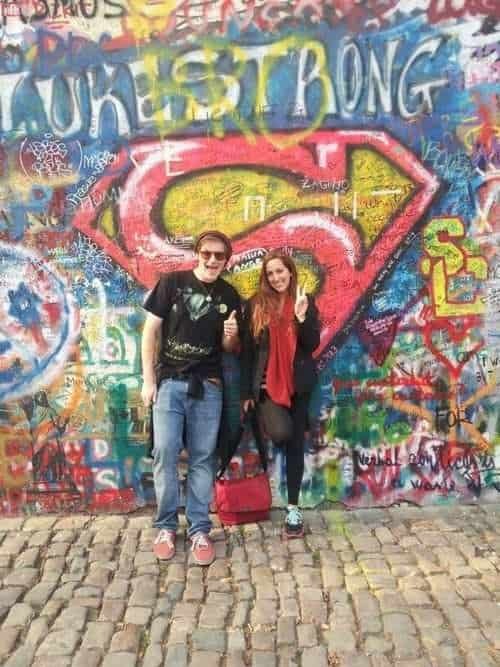 The Lennon Wall was once a normal wall, however at the beginning of the 1980s it has been filled with John Lennon-inspired street art and pieces of lyrics from Beatles songs (my favorite!!). They were protesting against the communist regime. Put yourself in their shoes, media was not democratized (i.e only the wealthy or powerful controlled mass media through TV, print & newspaper, unlike today where the Internet has allowed anyone and everyone to become publishers). So the young Czechs did not have access to Social Media and most certainly not Facebook. So, they used this “wall” as place to express their anger, thoughts and fears with the establishment. The communist regime become frustrated and irritated with this space and constantly removed the paint. Even when the wall was repainted by the authorities, on the second day it was again full of poems and flowers. The wall continuously undergoes change and the original portrait of Lennon is long lost under layers of new paint. Today, the wall represents love and peace. Peace man! The group are now on their way back home, to Israel that is! What an amazing adventure. See you in Holland!